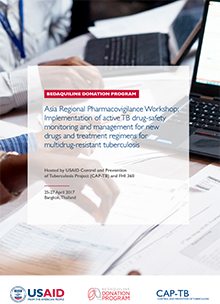 The USAID Control and Prevention of Tuberculosis (CAP-TB) project convened stakeholders from several countries for the Bedaquiline Donation Program’s Asia Regional Pharmacovigilance Workshop: Implementation of Active TB Drug-safety Monitoring and Management for New Drugs and Treatment Regimens for Multidrug-Resistant Tuberculosis, held in April 2017 in Bangkok, Thailand. A conference report details topics discussed and objectives achieved during the workshop. The presentations cover various treatment and programming updates for multidrug-resistant tuberculosis.